Would you like to train your puppy? 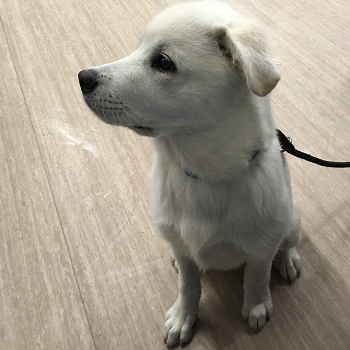 At Brookwood & Normandy Dog Training, we offer puppy and dog training classes at reasonable prices. Get in touch with us today. An introduction to training for puppies of all breeds aged 3 to 5 months old. 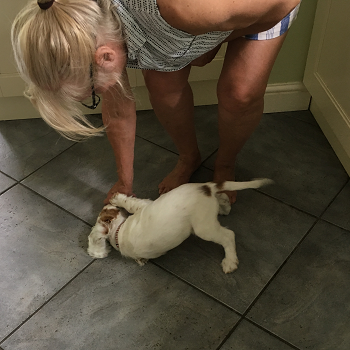 What better start can you give your puppy than learning how to avoid problems. After all it’s easier to train your puppy correctly from the start than to correct problems once they occur. 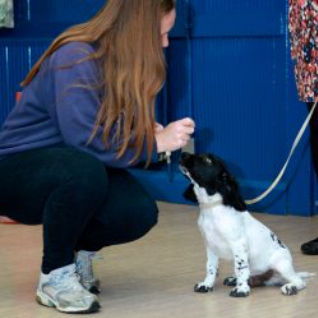 So these puppy training visits are tailored to your needs and are suitable for puppies of any age. As I will come to you, your puppy doesn’t need to have completed its vaccinations. I frequently get asked to advise on toilet training and chewing as well as starting their basic training. £75 per session: Monday – Friday, up to half an hour travel time from Guildford. Please give at least 48 hours notice for cancellation. If you give 24 hours notice, 50% fee will be payable. If you give less than 24 hours, or you do not attend, the full fee will be payable.